Today’s feature is an ancient name worn by a delightfully dangerous television vampire. Goth Week continues, and Drusilla is our Baby Name of the Day. Drusilla comes to us from an Ancient Roman family name: Drusus. The prevailing theory is that the original Drusus took his name after defeating a Gallic chieftain named Drausus, sometime in the third century BC. Plenty of others answered to the name. Then came Livia Drusilla, wife and adviser of the Emperor Augustus. Some accounts paint Livia as a model Roman matron. Others suggest she’s scheming and power-hungry. Either way, she was certainly influential. And Livia, for all her strengths and faults, put the name Drusilla on the map. Another Drusilla was Julia Drusilla, sister of Caligula. Rumors suggest they were lovers. This Drusilla died young, and her brother mourned by having her declared a goddess and later naming his only daughter after her. There’s a Drusilla in the New Testament, too. 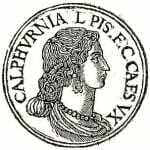 The daughter of Herod Agrippa, Drusilla was married to Felix, the Roman governor of Judea. Felix and Drusilla heard the apostle Paul speak when he was captive in Caesarea. It isn’t recorded if Paul’s teachings changed their lives. We do know that Drusilla perished at Pompeii in 79 AD. As a given name, Drusilla saw some use over the years. The name was rare, but not unknown, in the Middle Ages. A handful of girls were named Drusilla in the late nineteenth and early twentieth centuries, too. Doubtless some parents were inspired by the Bible, and others by the ancient world. Robert Graves’ novel I, Claudius was published in 1934. Two actresses: British stage and screen actress Drusilla Wills, and Drusilla Davis, who played small roles in big movies like Gentlemen Prefer Blondes. In Thomas Hardy’s Jude the Obscure, Drusilla is Jude’s great aunt. William Faulkner’s The Unvanquished is a collection of stories about a family during the Civil War, published as a serial in the 1930s. Cousin Drusilla is a key character. 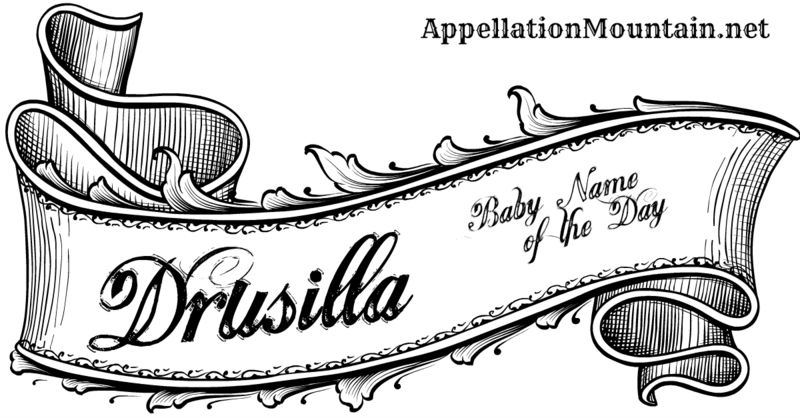 A handful of girls received the name every year, but Drusilla remained obscure. Drusilla Goes Goth: Thanks, Joss! In the second season of Buffy the Vampire Slayer, Buffy faced a new set of enemies – a pair of British vampires: Spike and Drusilla. Drusilla was crazy, from her first appearance on screen. She was semi-psychic, given to talking in riddles. Neither character was meant to last, but both Spike and Drusilla would appear in Buffy and spin-off series Angel over the years, as well as comic books. The vampire is the major reason why Drusilla leans Goth – and yet, she’s not likely to be a household name by the time a Drusilla born today reaches grade school. American parents like an elaborate name for a daughter, trading Alexandra for Isabella, and then moving on to Annabelle. Drusilla fits the pattern. And, like Alexandra, she has a boyish nickname built-in: Dru. And so if Drusilla appeals to you, this could be the ideal familiar-but-seldom-heard kind of name that wears well. What do you think of Drusilla? How would this name wear today? Drussy would be cute for Drusilla, just pronounced it much like Flossy, Florrie, Cressie, Mondy, Polly and many other dulcet dainties nicknames. Another Alternative to Drussie, Dru, and Sillia/Cillia is … Dutz. I saw this used as a short form for the full names Dousabella and Dulcibella. I think the name feels Gothic because of the Gothic Victorian era. I wouldn’t have made the connection to Buffy, let alone that being the reason for the Gothic feel. 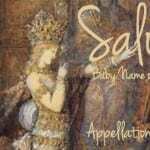 The Victorians’ loved medieval names! I like it. It was a family name for me in the middle ages. I would probably use spelling variant Drucilla more, because I find Cilla as appealing as Dru. Admittedly, the easiest to use would be Livia. But Drucilla has an appealing mix of clunk and, well, goth drama. I used to teach a girl called Drusilla. She was a lovely girl so the name has positive connotations for me. She’s the only real life Drusilla I’ve met though. I have a soft spot for Drusilla. It also reminds me of parents who love the nickname Drew for a little girl, but always latch onto Andrew as the only option when they have the lovely Drusilla to choose from. Those of us who grew up with Disney movies are going to find it hard to get past Anastasia and Drusilla, Cinderella’s awful step-sisters. Ah, but she was Drizella! I thought of Cinderella straight away too even though I know the difference. I grew up with Disney and I didn’t make the connection!